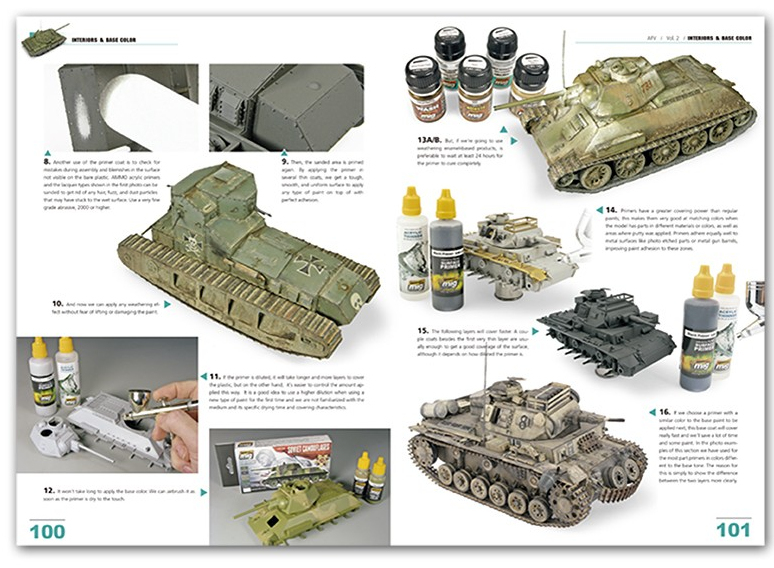 The Modelling News: AMMO’s new products – Reading, painting inside and out – it’s all covered in September. 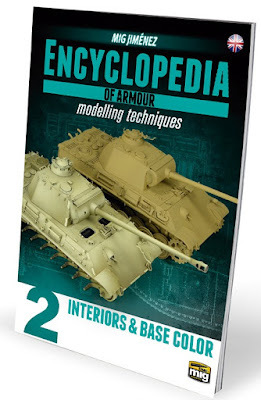 The definitive Encyclopaedia of Armour Modelling Techniques by Mig Jimenez, creator of the FAQ 1 and 2, and the bestselling instructional books in the history of modelling, brings you the comprehensive Volume 2. 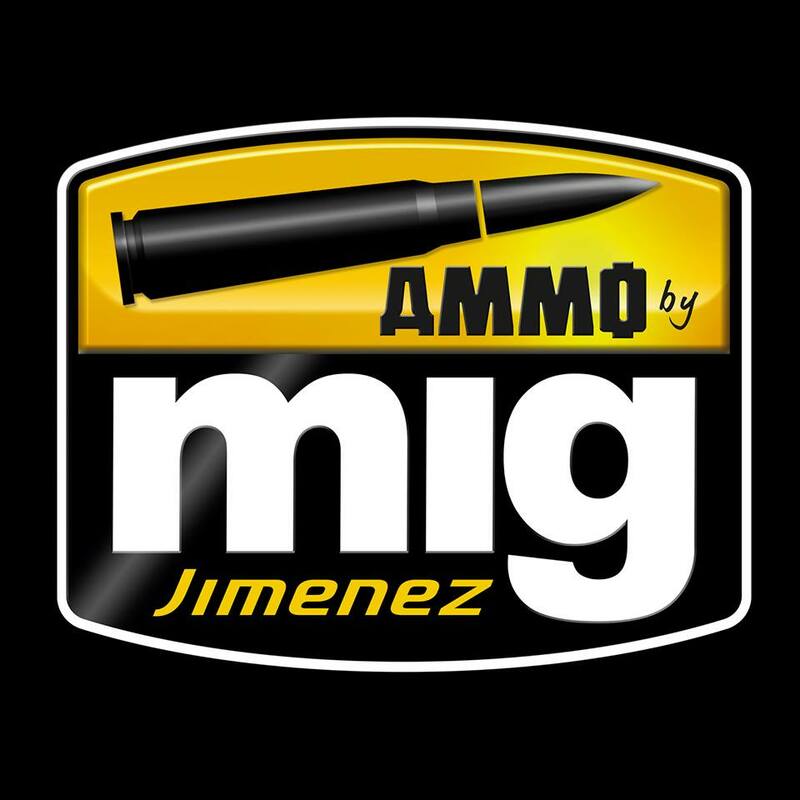 Created by Mig Jimenez and a selection of the best tank modellers around the world under his direction. 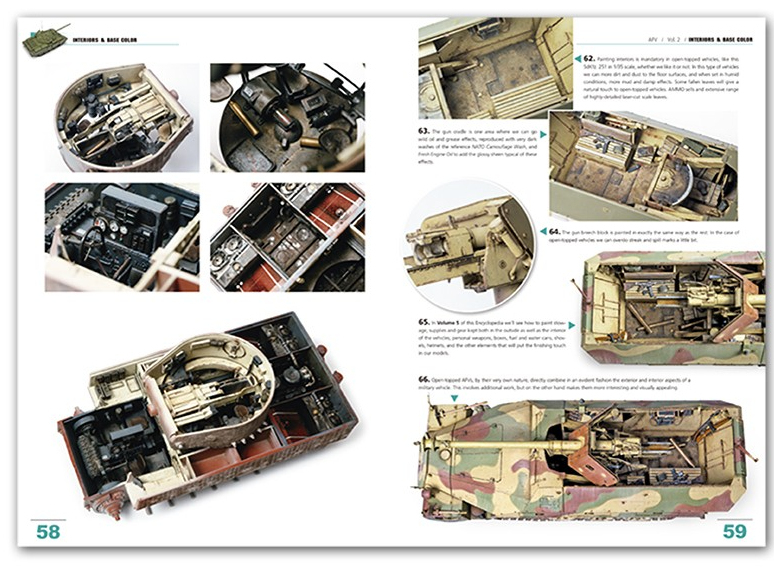 Through the 152 pages and more than 800 high quality and large full-colour photos of this second volume, modellers can learn everything they will need for painting base colours and interiors. From the easiest processes for the beginner to the advanced techniques for the more experienced modeller. Volume No. 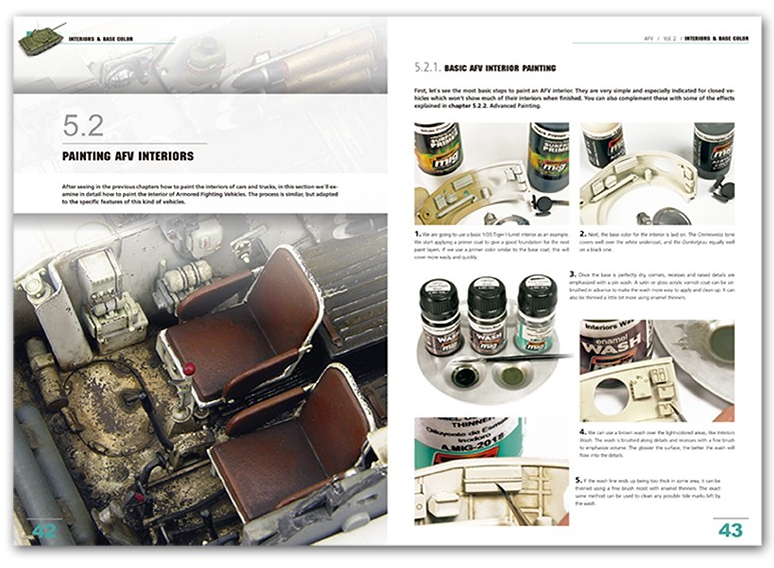 2 features in-depth explanations for all tools and products used to paint a base colour, including documentation for each paint processes and preparation of surfaces before paint. 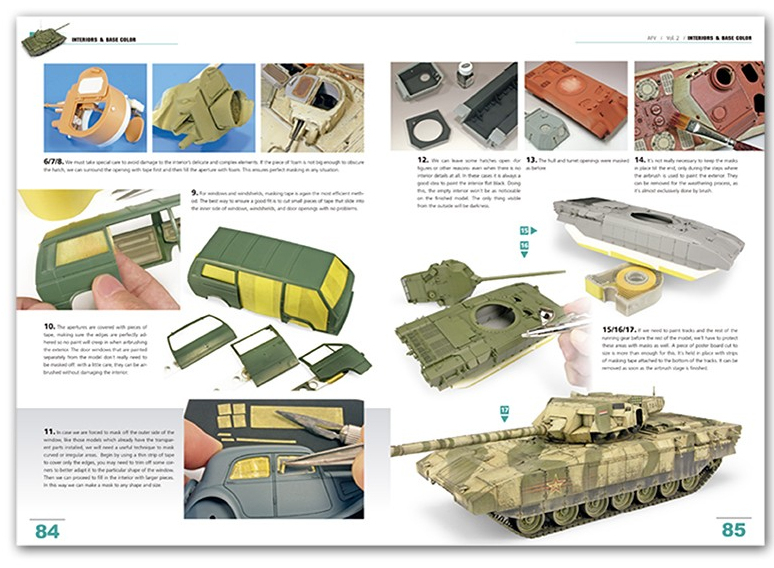 The modelling reader will find detailed explanations on how to paint vehicle interiors of all kinds including trucks, open vehicles, tanks, and engines. 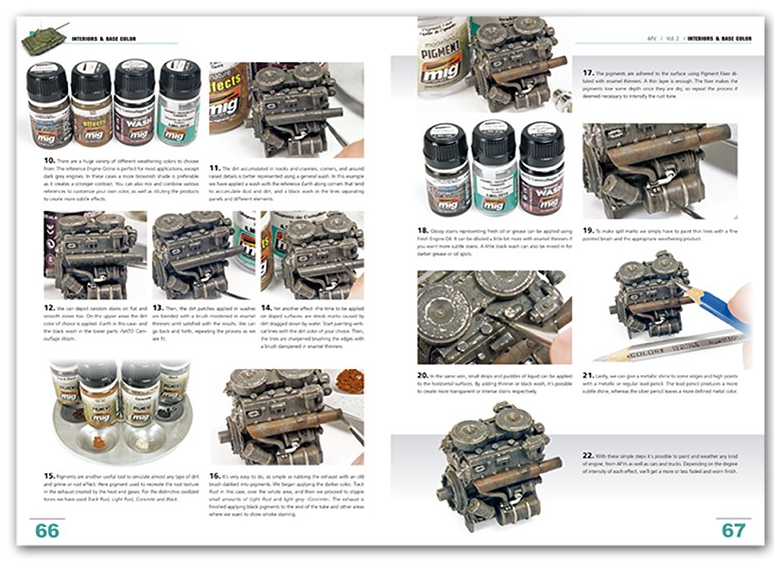 Finally, Vol 2 will show us everything regarding base colour application and exterior painting such as airbrush techniques, primer use, pre-shading, base coats, effects with the airbrush and base colours, how to apply decals, and much more. The processes outlined in this encyclopaedia are composed of highly informative text and volumes of photos explaining every step in great detail. 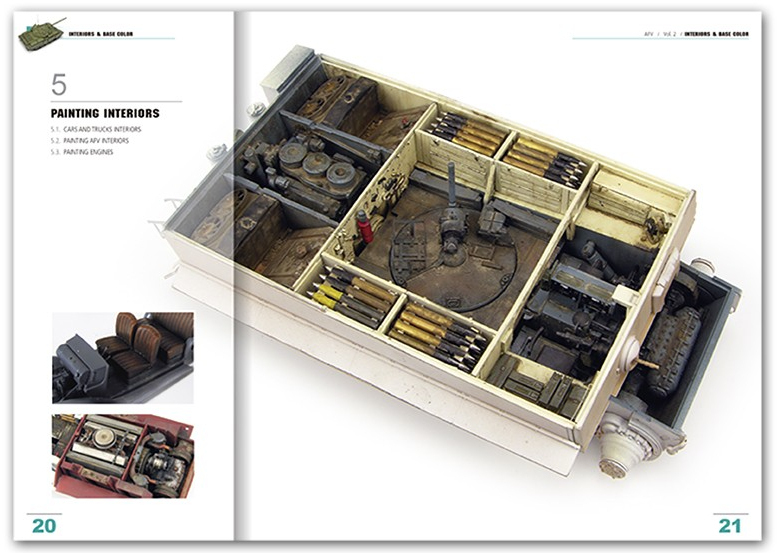 This encyclopaedia is thus the ultimate modeller's guide, an essential tool for the table and workbench of all model fans of armoured vehicles. This second volume is supplemented by four soon to be released volumes, each covering armour vehicle modelling in extensive detail. 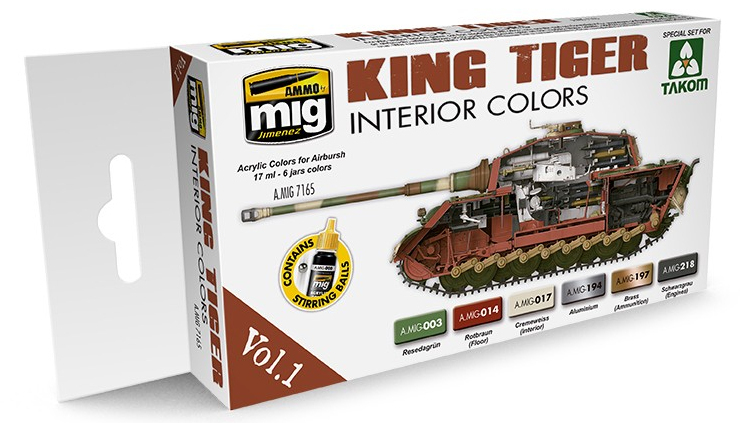 This set includes the necessary and accurate colours to paint the interior of a King Tiger. 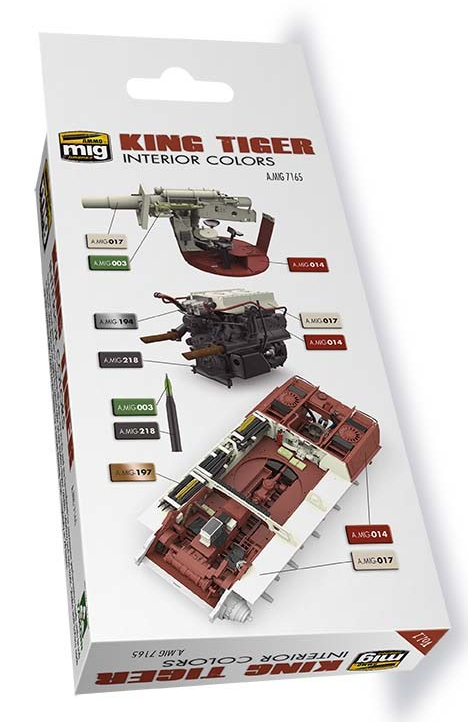 From the Cremeweiss colour for the fighting compartment to the green of transmission and gearboxes through to the engine colours. 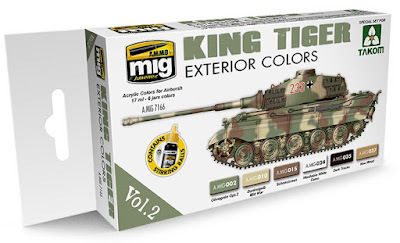 Although the set is a special edition for Takom’s King Tiger, it serves to paint any other King Tiger and many other German tanks during the end of the war. All 6 jars are acrylic and formulated for maximum performance both with brush and airbrush. The Scale Reduction-Effect will allow us to apply the correct colour on our models. Water soluble, odourless, and non-toxic. Shake well before each use. Each jar includes a stainless steel agitator to facilitate mixture. 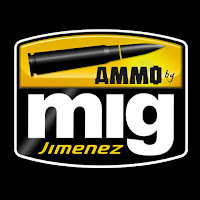 We recommend A.MIG -2000 Acrylic Thinner for correct thinning. Dries completely in 24 hours. This set includes the necessary and accurate colours to paint the exterior of a King Tiger. 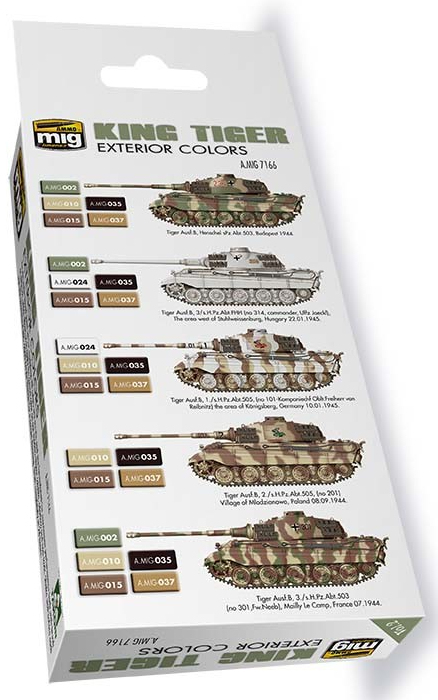 From the characteristic Dunkelgelb base colours and brown and green camouflage of many camouflage patterns to the accurate colours for tools and tracks, including the white washable paint for winter camouflages. Although the set is a special edition for Takom’s King Tiger, it serves to paint any other King Tiger and many other German tanks during the end of the war. All 6 jars are acrylic and formulated for maximum performance both with brush and airbrush. The Scale Reduction-Effect will allow us to apply the correct colour on our models. Water soluble, odourless, and non-toxic. Shake well before each use. Each jar includes a stainless steel agitator to facilitate mixture. We recommend A.MIG -2000 Acrylic Thinner for correct thinning. Dries completely in 24 hours. For Luftwaffe late war schemes. This set covers the colours used by the Luftwaffe during the early stages of WWII (1939 to 1941). 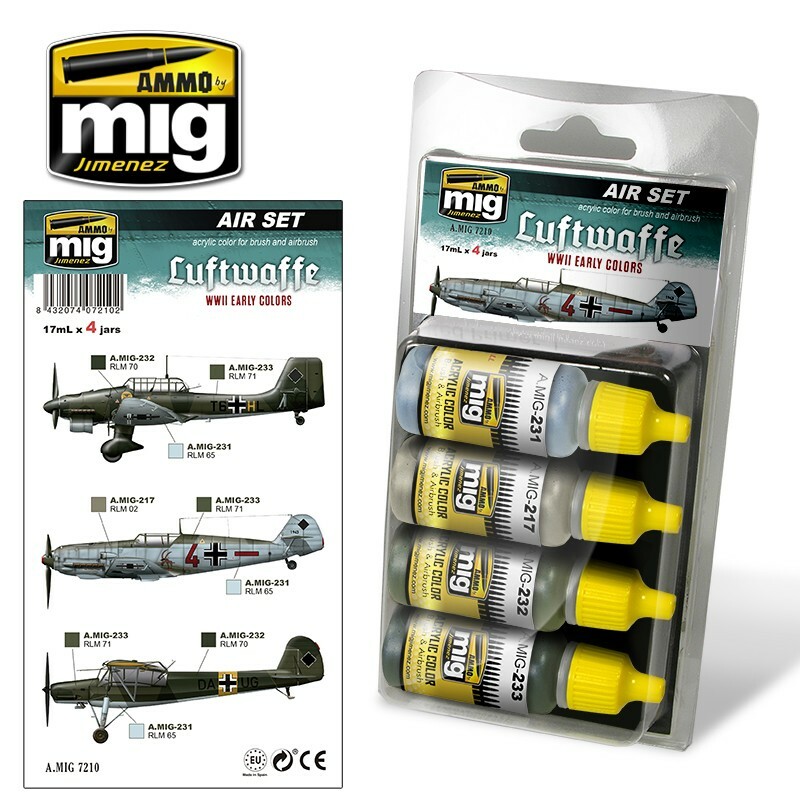 These specific colours were used both for bombers and fighter during the early war period, so it is perfect to paint fighters during the Battle of Britain or a Ju-87. This set provides the base colours necessary without need for complex mixtures and complex researches. The colours are accurately and slightly lightened for scale reduction effect of any kit. All products are acrylic and are formulated for maximum performance both with brush or airbrush. Water soluble, odourless, and non-toxic. Shake well before each use. Each jar includes a stainless steel agitator to facilitate mixture. We recommend A.MIG -2000 Acrylic Thinner for correct thinning. Dries completely in 24 hours. 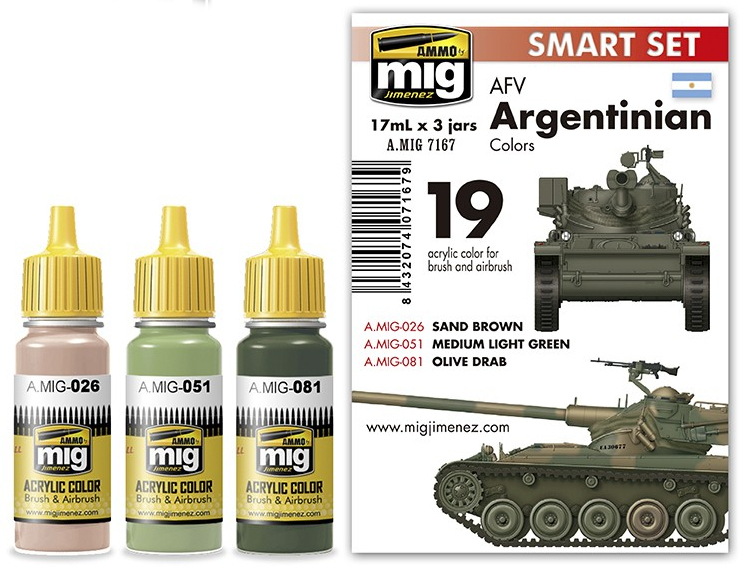 This set offers the specific and accurate colours to paint Armoured Fighting Vehicles in use by the Argentinian army such as AMX 13 and others. All 3 jars are acrylic and formulated for maximum performance both with brush and airbrush. The Scale Reduction-Effect will allow us to apply the correct colour on our models. Water soluble, odourless, and non-toxic. Shake well before each use. Each jar includes a stainless steel agitator to facilitate mixture. We recommend A.MIG -2000 Acrylic Thinner for correct thinning. Dries completely in 24 hours.